Wow, Yahoo finally beats Google at a product. What can only be viewed as a win for Yahoo, Google shut down Google Answers and lost out to Yahoo Answers in the new social search arena. One of the best articles/posts I saw out there was courtesy of the NY Times called Google Is Shutting Down Answers Service. Why did I think it was the best out there? Because they correctly pointed out that "Google has introduced dozens of other services, many of which have not turned into hits. The company has said that experimentation is an important part of its strategy and that a high failure rate for new products is to be expected." I wrote about Google's product extensions back in May and pointed out that most people only use Google for search and that they were far behind Yahoo in social search. Remember, Google can make mistakes along the way when they extend out past PPC. Back in that May post it looked like other than search, Gmail was the only significantly used product. GoogleFinance? When was the last time you used that? Seriously? Bill Tancer over at Hitwise provided this chart on Yahoo Answers which shows that it is far an above the market leader. Does it seem like I'm jumping for joy? No. I love both companies and if you've ever seen a media strategy from me I always include both because they perform. I just think people, bloggers, MSM, and analysts should give some love to Yahoo for finally beating Google at something. Is it a major battle? No and it probably helped Yahoo that Google was charging for answers But, Yahoo needs a little victory to change momentum and perception in the marketplace because they are a quality company no matter what their Peanut Butter tastes like. Google tries a lot of different things so they don't get caught unprepared. However, that doesn't mean everything they touch will turn into GoogleGold. A little experimentation is the right strategy, but whenever Google makes an announcement these days it looks like from the reports and analysis that they will take over the world of advertising (see next post). Its like their stock can do no wrong and just keeps going up, up, up and that my friends in when you should keep a close eye on your positions - remember the go go days of internet stock in the 90s? 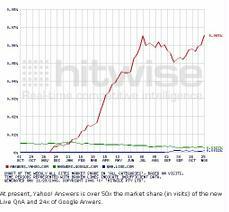 Bill Tancer from Hitwise updated information on which Google products people use based on the demise of Answers; I referenced his earlier analysis in a link above. In summary according to Hitwise, 88% of Google's use is plan old search, 93% is search+Gmail, and 95% is search, Gmail, and Video. All of the other product announcements launched with such fanfare like Finance, Spreadsheets, Calendar are not being used today. Product extensions and experimentation are great, but lets not start throwing dirt on category leaders like Yahoo Finance or Microsoft Office before people start visiting those pages. wuyaSea.com welcomes all google answer refugees. Check it out plz. Thank you.